As the flu season continues to impose its will throughout the country, many individuals will be required to take time off of work to fully recover from the illness that affects five to 20 percent of the U.S. population annually. However, there are many steps that you can take to ensure that your immune system is standing by to combat invading bacteria. Today, we will be taking a brief look at some of the many ways that chiropractic care can help strengthen your immune system during the cold and flu season. At Elevate Chiropractic, we are devoted to helping residents of Fort Collins begin living the life they love. Too often, individuals are kept from doing the things they love most due to limited mobility, chronic pain, or unresolved injuries. That’s why we work alongside all of our patients to help find the root source of their health issues, so that we may create a patient-specific plan designed to restore your wellbeing. Learn more about how chiropractic care can help boost your immune system below. According to the National Center for Biotechnology Information, the immune system “protects the body like a guardian from harmful influences from the environment and is essential for survival. 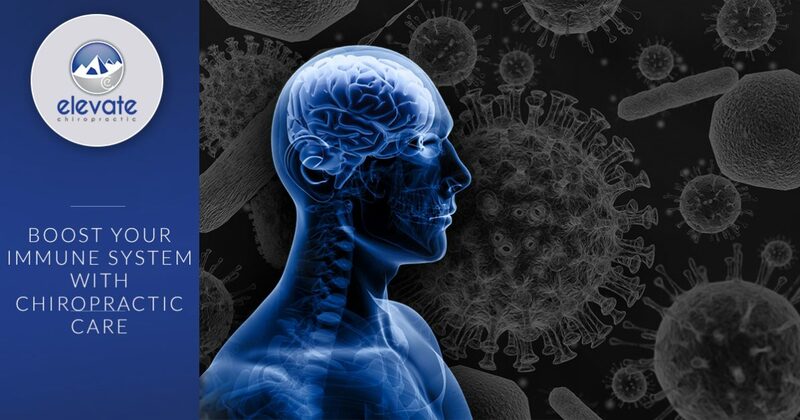 It is made up of different organs, cells and proteins and aside from the nervous system, it is the most complex system that the human body has.” However, more and more data is beginning to suggest that the nervous system and the immune system communicate with one another in order to properly function. When the spine experiences vertebral subluxation, the neural pathway linking the brain and the body is compromised. This can make it difficult for the brain to properly communicate with the body, and can even put those experiencing vertebral subluxation in a constant fight-or-flight-state. By correcting vertebral subluxation, chiropractic care can restore the brain-body communication pathway, allowing the immune system to function properly as it normally would. The result is improved health, a fortified immune system, and a properly functioning sympathetic and parasympathetic nervous system. To learn more about how chiropractic care can help improve all aspects of your life, schedule your free consultation with Elevate Chiropractic today. We work hard to ensure that you feel safe and welcome in our chiropractic office, and that starts by offering the highest level of care for all of our patients. Contact us today to learn more!